Though categorised and treated as a book, the Qur'an is not a "book" in the ordinary sense of the word. It is neither a treatise nor a dissertation on dogmas or a particular theme, nor is it a book on Religion. It is a unique book, the only one of its kind in all the world. Its overall style and the organisation of its subject matter differ in essence and format from the other religious scriptures. 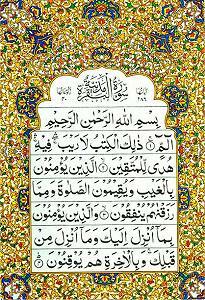 The literal meaning of the Arabic language word Qur'an is "reading or recitation [par excellence]". This Holy Book of Islam is not the composition of a man, nor is it the collected thoughts or opinions of wise men through the ages. It is the "Words of the Almighty God", the Creator and the Lord of the universe, available in its original form and preserved intact. It is the last and final divine guidance for mankind, a re-statement, correction, completion, and perfection of the earlier messages. The subject matter of the Qur'an revolves around man (human beings), and it approaches those aspects of his life which lead to his real success or failure. The central theme that runs through the Qur'an is an exposition on Reality, with the agenda of inviting mankind to the right path. Its purpose is not simply to instruct or even to convert to something new, but to mould and transform man in accord with his innate being. As such, the Qur'an proceeds simultaneously, in its own unique style, to inform, to reorient and then to motivate and mobilise men and women to fulfill their mission in life. It invites man to use his intellect, to think and reflect, and to attain to faith. God, after creating the human race, has not left us without any direction in our lives. If the loving Creator has provided us with what we need for our physical existence, growth, and protection (e.g., air, sustenance and shelter), He has also provided us with what we need for our moral and spiritual existence, development, and security. The Qur'an is but this provision to mankind - divine guidance in the widest sense of the word. No one can know with certainty about the unseen and incomprehensible Realities (such as God and His attributes, man's purpose and mission of life on the earth, his life after death, etc.) alone through instinct, habit, intuition, reason, or experience. No one can have the unquestionable knowledge of the ultimate values to which human behaviour should conform. Mythology, philosophy, history, etc., the sources of guidance developed by mortal man himself have their own limitations, are subjective, may be ethno-centric or age-bound, and can be grossly misleading. Man has to depend on and trust what his Creator has informed him about and prescribed for him. Divine guidance thus is an essential human need. The glory and majesty of God is so awesome and overwhelming that a limited, mortal, flesh-and-bone human being is not capable and equipped to receive direct contact with Him. So, in order to communicate with man, God has chosen the ways He knows to be the most appropriate. The transmission of the message of divine guidance to His selected agents (called Prophets/Messengers) via the archangel Gabriel, is a specific process of communication, which we term "Revelation". The Qur'an was revealed in the seventh century of the Christian Era to Prophet Mohammed ('peace be upon him') - the last and final among a long chain of the Prophets of God who had been raised up in different parts of the world. The Qur'an was revealed in stages, bit by bit, as occasion or situation made relevant various verses, over a span of 23 years. As the verses of the Qur'an were being revealed, they were memorised by the Prophet. He then conveyed these "readings" or texts verbatim to his Companions, and instructed certain scribes to write them down. 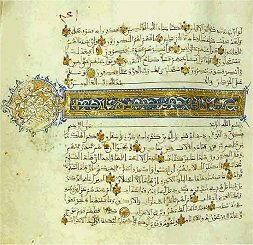 The Qur'an was thus completely preserved both by memorisation and in written form during the life time of the Prophet. The verses and passages were arranged under divine instructions to the Prophet to arrive at their present order, which is something other than a chronological sequence. is totally and purely the "words of God". It does not contain anything other than the Word of God, not even a word of Prophet Mohammed - 'peace be upon him'. (The sayings of the Prophet, called Hadith, are compiled as separate books.) The Qur'an itself claims that it is without doubt from God Almighty. has a form of language and style that cannot be imitated by humans. It has stood as a challenge to the literary ability of men of letters. It is a living miracle, articulated by an unlettered Prophet. remains with us today in a contemporary living language, and stands independent of translations. The original clear Arabic text can always be referred to for deciding any controversy. Its language, Arabic, is still widely spoken and understood today, one of the top ten languages of the world. 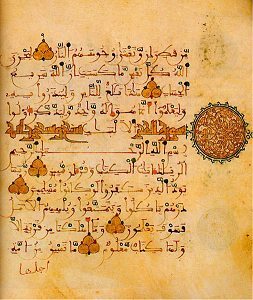 In fact, the Qur'an has kept the Arabic language a living tongue and remains its standard. has been preserved in its exact original form, in its entire content, as it was revealed to the Prophet fourteen centuries ago, not a word added or removed. This is a historical fact beyond dispute. God Himself has assured us of its preservation (Qur'an chapter 15, verse 9). Thus, there has been only one version of the Qur'an all across the world, all through the ages, right from the time of the Prophet. has always been in the hands of the people and was never a property of clergy or a section of the society. is memorised by millions of Muslims the world over, including children as young as 8-10 years old. It is recited regularly, abundantly, and on some occasions completely, both within the ritual prayers and elsewhere. in a spirit of reverence and thoughtful attention, and not with the casual treatment given to an ordinary book. This is a Holy Book and is to be handled with respect. The reader is expected to be clean in person and place of sitting, and should never put it in an unclean place. 0 mankind! There has now come unto you an admonition from your Lord, and a cure for all [the ill] in your heart ? and for those who believe, a guidance and a mercy.